Guildford has a long and well-developed association with the fine arts. John Russell RA, possibly the most famous local to rise to the top of the art world, lived here and was the official pastel painter to both King George II and his son, the Prince of Wales, who later became King George IV. In modern Guildford, the art scene is still very much alive and thriving with many art related clubs and community groups, and several artist groups working collaboratively in shared studio spaces. A twenty-minute drive away in Farnham is the campus of the University College of the Creative Arts from which many successful modern artists have graduated, so it is perhaps not surprising to learn that Guildford has a strong artistic culture. There are art supply shops, picture framing facilities, art-and-craft shops selling the works of local painters, designers and sculptors, and, of course, several commercial galleries show-casing the results of so much artistic potential. 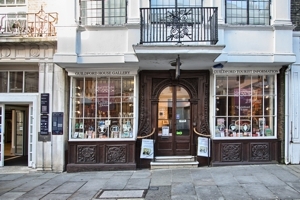 The gallery is located in a Grade I listed townhouse, built in 1660 and home to the Guildford Borough Art Collection since 1959. It is located at the top of the High Street, a little way beyond the famous clock, and access is through the Tourist Information Office. Run by the local authority, it brings together the Councils’ own extensive art collection and a varied programme of temporary exhibitions, talks, workshops and art shows. There is a small cafe attached to the gallery, together with an art-and-craft shop. If you are unable to physically visit the gallery, much of the collection can be viewed online via the Guildford Borough website. 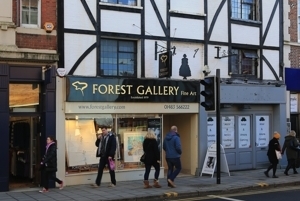 The Forest Gallery is a commercial gallery, located at the top of the High Street, on the right-hand side when looking up the hill. With a modern frontage, large window display, and the name in large letters right across the front, the gallery is difficult to miss. Works by various artists, including locals, are displayed over two floors with an emphasis on contemporary fine art, sculpture and limited edition works. The gallery is part of the national Castle Galleries chain. 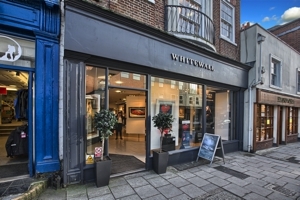 Once again, located on Guildford’s historic High Street, the Whitewall Galleries are easily located and free to access. It is a commercial gallery and belongs to the extensive Whitewall Galleries chain, exhibiting contemporary works from around the world, and hosting art related events, including evenings with well-known artists. 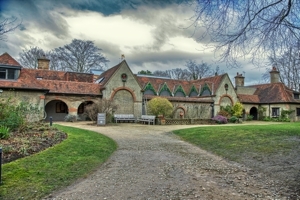 Unlike the other local galleries, the Watts Gallery is set in its own extensive grounds just outside Guildford in the village of Compton. The gallery should really be considered as three different venues, closely linked and with a common theme. 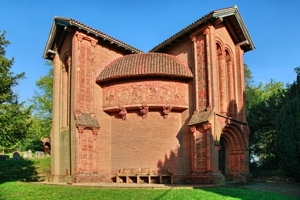 The Watts Gallery itself was opened in 1904 to display the works of the Victorian artist George Frederick Watts OM RA. Thanks to careful restoration the entire collection can still be viewed in a gallery that displays the original decoration and retains a Victorian atmosphere. Watts’ paintings include monumental works, landscapes and portraits. In addition to the paintings, there is a fine collection of Watts’ sculptures, often featuring a classical theme. The second area – Watts Studios – is a still work in progress. The area is part of the restoration of the original studio spaces used by Watts and his wife, Mary Watts, which includes the creation of a new studio space, two new galleries and a conservation facility. When completed, the new area will host displays, demonstrations, talks, workshops and special events that involve the public in the life of the gallery. Mary Watts was the inspirational force behind the chapel, running classes to teach enthusiastic locals how to create clay tiles adorned with intricate designs that she had created especially for the building. And, if the outside impresses you, just wait until you see the inside! 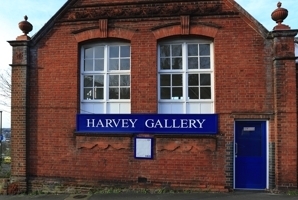 Unlike the other galleries in Guildford, the Harvey Gallery is a much more ‘community education’ orientated space. Owned by the local authority, the Harvey Gallery is the town’s main venue for exhibiting the best of local arts and crafts, including painting, sculpture, glasswork, jewellery, textiles and photography. The purpose is to support local artists, art groups and organisations rather than to sell art works on a commercial basis.